RETAIL $79.95 Our Price Only $39.95 each. Medical Review Officer Review / confirmation of Lab results. RETAIL $28.95 Our Price Only $14.95 each. 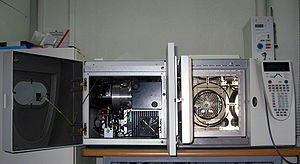 The use of a mass spectrometer as the detector in gas chromatography was developed during the 1950s by Roland Gohlke and Fred McLafferty. These sensitive devices were bulky, fragile, and originally limited to laboratory settings. The development of affordable and miniaturized computers has helped in the simplification of the use of this instrument, as well as allowed great improvements in the amount of time it takes to analyze a sample. 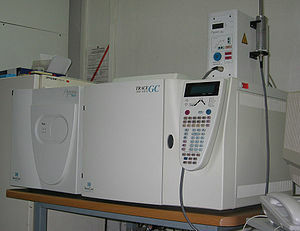 In 1996 the top-of-the-line high-speed GC-MS units completed analysis of fire accelerants in less than 90 seconds, whereas first-generation GC/MS would have required at least 16 minutes. This has led to their widespread adoption in a number of fields. These two components, used together, allow a much finer degree of substance identification than either unit used separately. It is not possible to make an accurate identification of a particular molecule by gas chromatography or mass spectrometry alone. The mass spectrometry process normally requires a very pure sample while gas chromatography using a traditional detector (e.g. Flame Ionization Detector) detects multiple molecules that happen to take the same amount of time to travel through the column (i.e. have the same retention time) which results in two or more molecules to co-elute. Sometimes two different molecules can also have a similar pattern of ionized fragments in a mass spectrometer (mass spectrum). Combining the two processes makes it extremely unlikely that two different molecules will behave in the same way in both a gas chromatograph and a mass spectrometer. Therefore when an identifying mass spectrum appears at a characteristic retention time in a GC-MS analysis, it typically lends to increased certainty that the analyte of interest is in the sample. A “full spectrum” analysis considers all the “peaks” within a spectrum. Conversely, selective ion monitoring (SIM) only monitors selected peaks associated with a specific substance. This is done on the assumption that at a given retention time, a set of ions is characteristic of a certain compound. This is a fast and efficient analysis, especially if the analyst has previous information about a sample or is only looking for a few specific substances. When the amount of information collected about the ions in a given gas chromatographic peak decreases, the sensitivity of the analysis increases. So, SIM analysis allows for a smaller quantity of a compound to be detected and measured, but the degree of certainty about the identity of that compound is reduced. Several GC-MS have left earth. Two were brought to Mars by the Viking program.Venera 11 and 12 and Pioneer Venus analysed the atmosphere of Venus with GC-MS.The Huygens probe of the Cassini-Huygens mission landed one GC-MS on Saturn's largest moon, Titan. The material in the comet 67P/Churyumov-Gerasimenko will be analysed by the Rosetta mission with a chiral GC-MS in 2014. In combination with isotopic labeling of metabolic compounds, the GC-MS is used for determining metabolic activity. Most applications are based on the use of 13 C as the labeling and the measurement of 13C/12C ratios with an isotope ratio mass spectrometer (IRMS); an MS with a detector designed to measure a few select ions and return values as ratios. Gohlke, R. S. (1959). "Time-of-Flight Mass Spectrometry and Gas-Liquid Partition Chromatography". Analytical Chemistry 31: 535. Gohlke, R (1993). "Early gas chromatography/mass spectrometry". Journal of the American Society for Mass Spectrometry 4: 367. V. A. Krasnopolsky, V. A. Parshev (1981). "Chemical composition of the atmosphere of Venus". Nature 292: 610–613. H. B. Niemann, S. K. Atreya, S. J. Bauer, G. R. Carignan, J. E. Demick, R. L. Frost, D. Gautier, J. A. Haberman, D. N. Harpold, D. M. Hunten, G. Israel, J. I. Lunine, W. T. Kasprzak, T. C. Owen, M. Paulkovich, F. Raulin, E. Raaen, S. H. Way (2005). "The abundances of constituents of Titan’s atmosphere from the GCMS instrument on the Huygens probe". Nature 438: 77–9–784. Goesmann F, Rosenbauer H, Roll R, Bohnhardt H (2005). "COSAC onboard Rosetta: A bioastronomy experiment for the short-period comet 67P/Churyumov-Gerasimenko". Astrobiology 5 (5): 622–631.